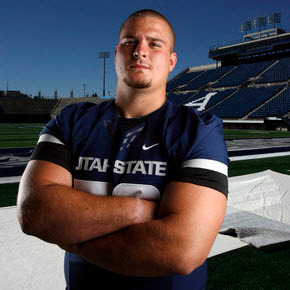 "Coach Andersen made us believe in ourselves," says Tyler Larsen, Utah State's highly regarded senior center. "We started to win and now it doesn't stop. Everyone here cares. We want to be winners, and we won't take anything else. I'm sensing another great year. Our goal is to go undefeated. We want to go out with an even bigger bang. We've got the most talent now of all the years I've been here. Coach Wells is a younger coach and his energy is rubbing off on all of us."